Soooo, I am totally eating my words after my last post. I had mentioned that it was starting to feel like Spring, but it would be typical if we got another big snowstorm. Sure enough, Sunday night we got a little less than a foot, enough to cancel school on Monday. We haven't had snow on the ground since mid February! The snow has already melted a little today since the sun is so warm, but they are calling for more snow later this week. Spring- you were so close! And, Easter is this weekend! Say what? This year we are actually going to do a "real" dinner for Easter. We usually head over to my husband's grandparents for the morning, but this year, Easter falls early. So, that means his grandmother is still in Florida! That means I actually have to do something involving easter eggs? Gasp! Well, I guess it's not that bad, we did dye easter eggs this past weekend. Does everyone have a big Easter dinner planned for the day? Do you follow the ham tradition? Or are you a rebel and break free of the expectations? 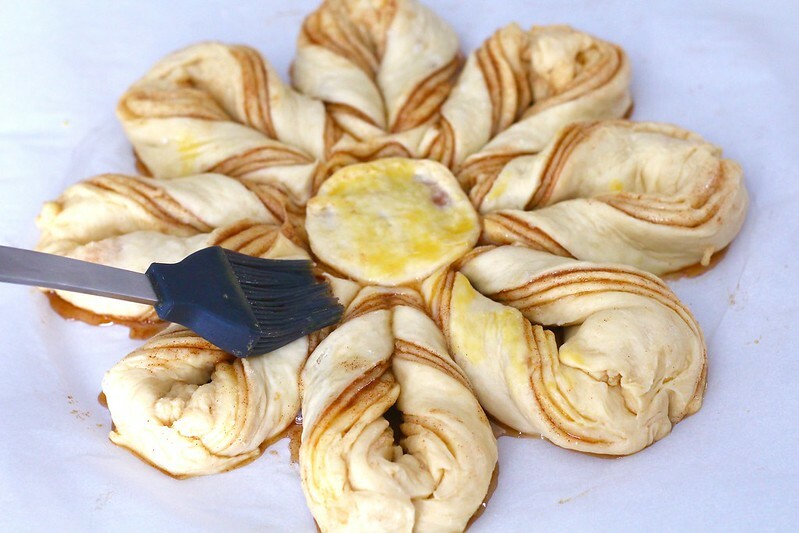 I was thinking that this cinnamon bread might make a killer showpiece on your breakfast table. I mean really, it's gorgeous! And, it's easier than it looks! The bread part is super moist and buttery. A simple sugar and cinnamon mixture is spread between three layers of the bread. 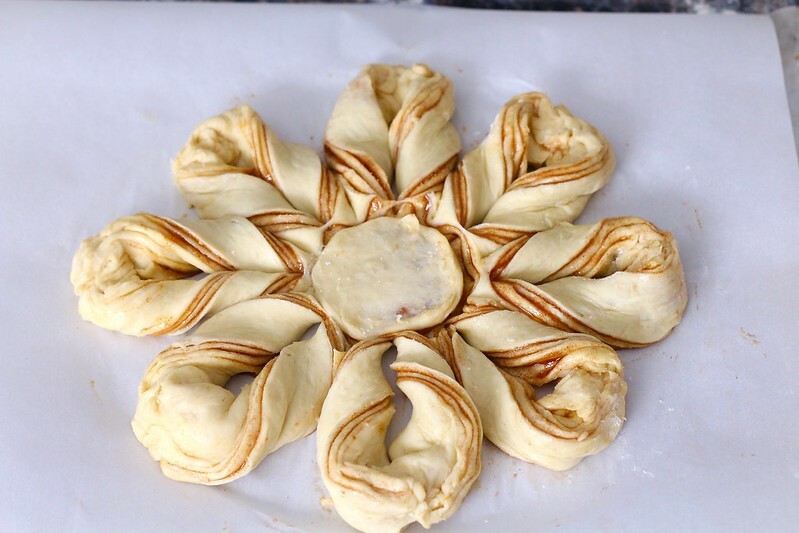 Then, you slice it into an even 16 pieces, do a little twisty-loo, seal and let rise again before baking. It is perfectly sweet and just down-right amazing. 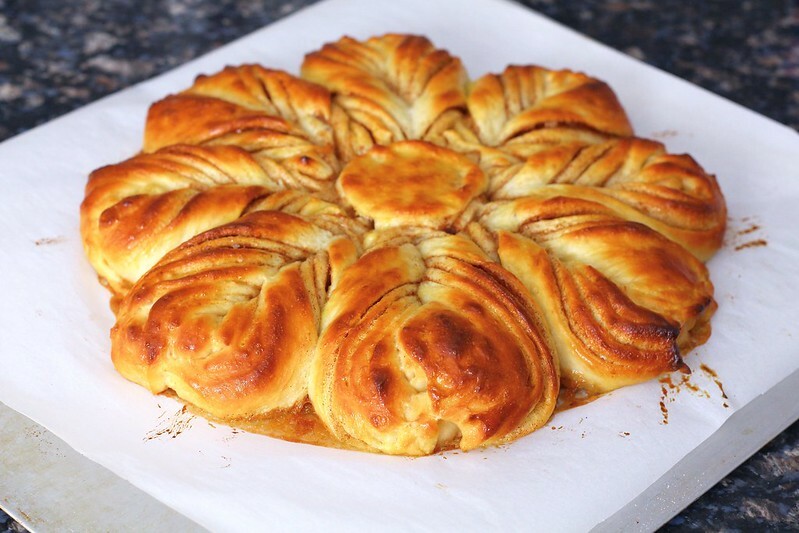 This is best served warm, preferably straight from the oven! But, you can heat it up in the oven the following day if timing is an issue. 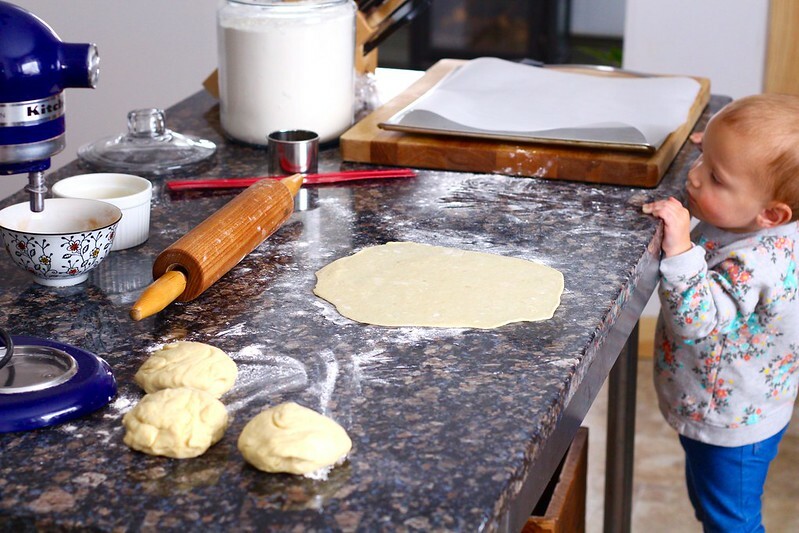 To make the dough, combine all the ingredients together in the bowl of a stand mixer fitted with the dough hook. Knead on medium-low speed until the dough is smooth and soft, 5-8 minutes. If it is too sticky, add 1 tablespoon of flour at a time. If it is too dry, add 1 tablespoon of water at a time until the right consistency is reached. Place in a lightly greased, large bowl and turn over once. Cover with plastic wrap and let rise until nearly doubled, at least 1 hour. On a lightly floured surface, divide the dough in four even balls. 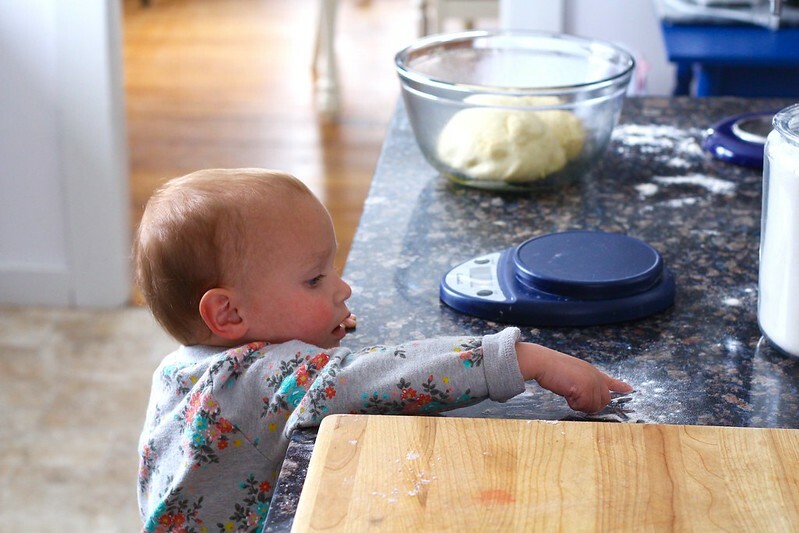 (Using a kitchen scales ensures even size dough balls.) Cover with plastic wrap and let rest for 15 minutes. 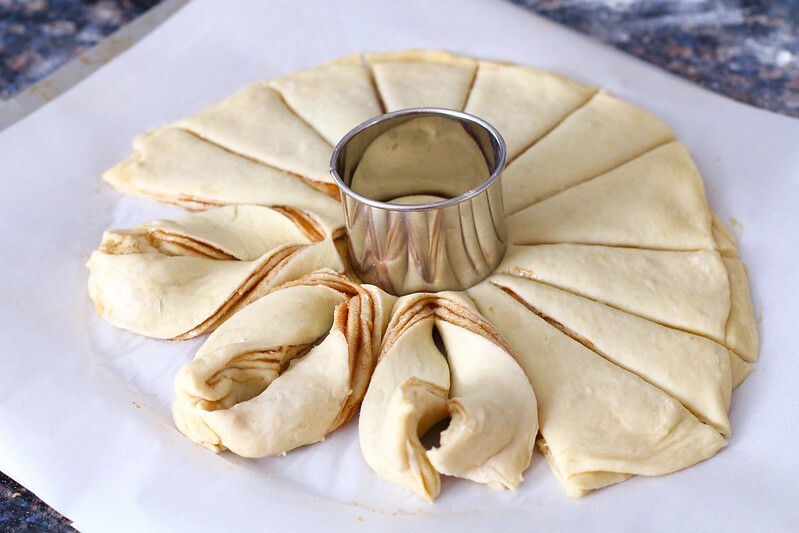 On a lightly floured surface, roll one piece of dough into a 10-inch circle. Place on a baking sheet lined with parchment paper. Brush the circle lightly with the beaten egg. Evenly spread 1/3 of the cinnamon-sugar mixture over the circle, making sure to leave 1/4-inch of bare dough around the perimeter. Roll out another ball of dough into a 10"inch round and place on top of the filling covered round. Repeat with egg wash and cinnamon sugar and layering process with the remaining dough balls, but leaving the top circle bare. Set the beaten egg aside, because you will be using it again. 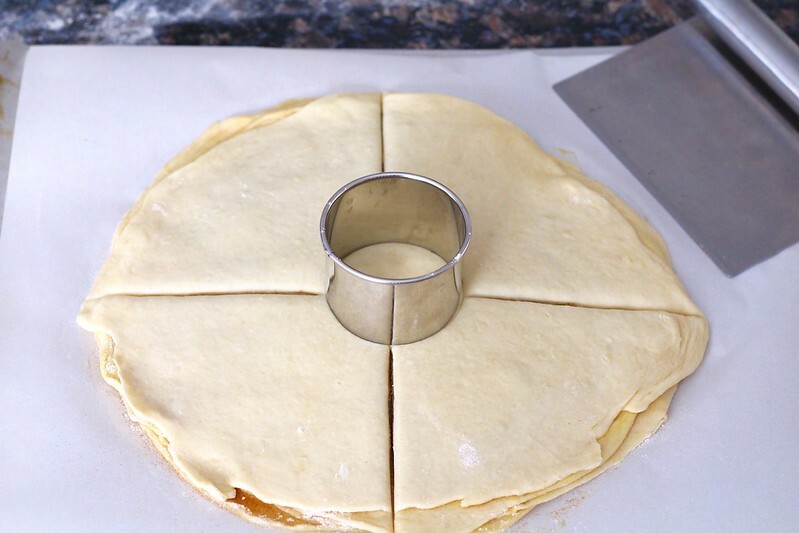 Place a 2 1/2-3 inch round cutter in the center of the dough (this is your guide). 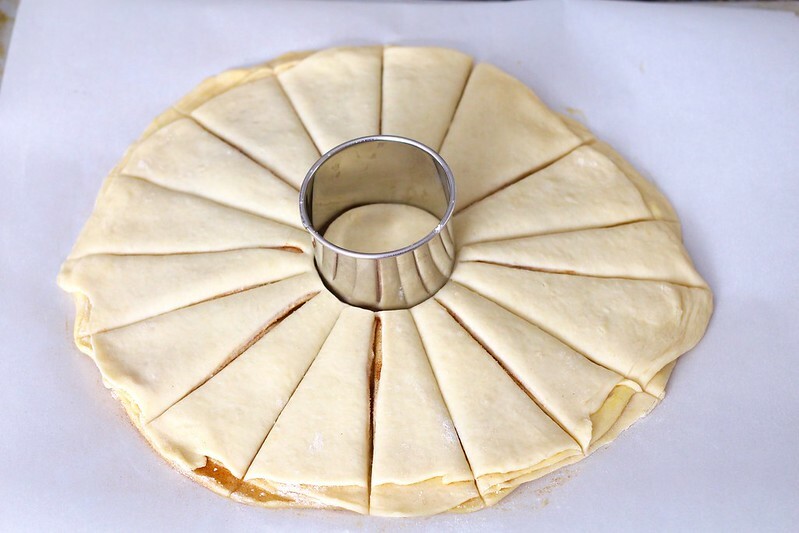 With a sharp knife or dough scraper, cut the circle into 16 even slices. Do not cut the center. Using two hands, pick up two strips that are next to each other. Twist them away twice from each other, then bring their ends together and pinch together to seal. Repeat the process until you have 8 pairs of strips. Remove the cutter. Cover the star with plastic wrap and let rise for about 45 minutes, or until it is noticeably puffy. Brush the top of the star gently with the remaining beaten egg. Place in the oven and bake for 15-20 minutes, until golden brown and a thermometer inserted in the center reaches 200°F. Remove from the oven and let cool for 10 minutes before serving. Refrigerate any leftovers and rewarm in the oven.